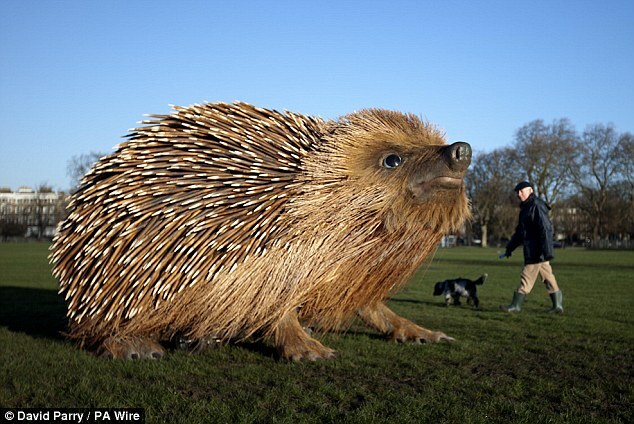 A giant sculpture of a hedgehog has been installed on London’s Clapham Common to mark the launch of Sir David Attenborough’s new BBC television series Natural Curosities. The seven-foot-tall sculpture features more than 2,000 wooden spines and fur made of willow and coconut fibbers, and was created by a team of artists over the course of two months. This entry was posted in Nature, Wildlife and tagged Clapham Common, Sir David Attenborough. Bookmark the permalink. Looking forward to Sir David’s new series. A must for all interested in natural history. That is a true work of art. A lot of attention to detail has gone into that. Yes, the sculpture looks great Tony, even when you are up close to it. Hopefully they will leave it on the Common for a while longer.